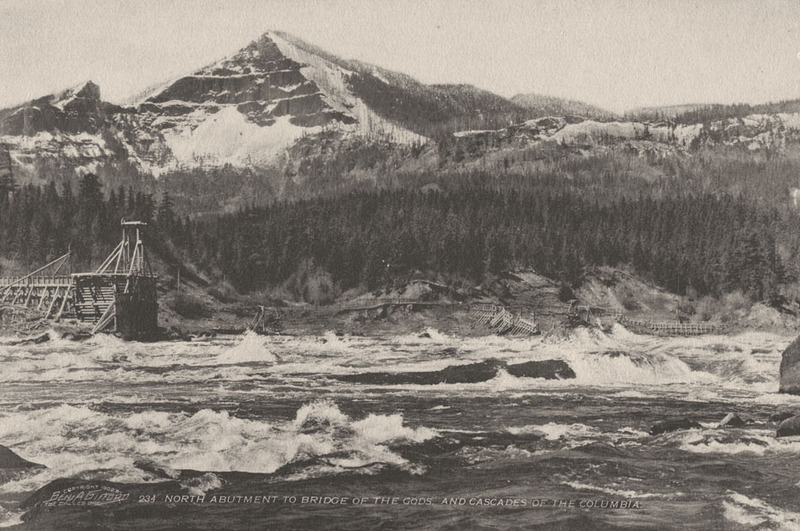 This 1902 Benjamin Gifford image of the Cascades of the Columbia makes it clear why the project to build ship passage locks was so important to navigation. It also gives a great view of some of the fish wheels used to catch salmon. The "Abutment to the Bridge of the Gods" mentioned in the photo caption refers not to the automobile bridge, which wouldn't be built for several years, but to the ancient volcanic flow which had dammed the Columbia, then over-spanned it, and eventually collapsed into it creating the dangerous and rocky cascades. Wonderful shot. Sure depicts the roughness of that river during that time. You can pick out where that old railroad went along on the other side of the river. Neat picture, but leaves me totally confused. What is the purpose of the big wooden structure in the left center of the picture. Looks to me like an abutement for a future bridge. And my laptop isn't all that clear, but the wooden structures in the right center don't look like any fish wheels that I have ever seen. And why in the world would they pull them out of the river on that steep bank. Surely they didn't anchor them offshore in that current. Think the current would have drug them and anchors downstream and probably torn them apart. Somebody enlighten me. Better yet, the structure on the left looks like something you could string a wire rope to from the other side and hang a small passenger cage to for the purpose of hauling a few peope at a time across the river. I'm warming up to the idea of that structure being the "abutment", but the photo is dated 1902 and the current Bridge of the Gods construction started in 1920 (completed 1926). I can't find any reference to earlier attempts to span the river at this spot. Maybe I should have saved this for a Mystery Monday? Arthur, can you tell if that round looking thing on the top left of the big "abutement" looks like a big pulley? Would that be a structure on Govt Island for unknown activities?And what is the upright structure to the left of the platform> But the wonderful photo with the wild water and then snow to outline everything is just great. Here is a photo of a fish wheel at Cascades. Not sure if it is the same one, but gives you an idea of what they looked like. This style is called a McCord fish wheel, supposedly first used by McCord on McCord Creek. The fish wheels were best used during high water. As you can see, it is winter time and the water is low. Also, the 1894 flood had just gone through a few years previously, which destroyed the railroad on the Washington side. That might be why the bank looks so washed out. Here is a good description and photo of the McCord fish wheel. Arthur....do you know anything about Lyn Topinka? Do you think that is someone who would speak at a "Sense of Place" lecture? I look at this photo with fascination at what it must have been like for that mountain side to come tumbling down. It would have totally changed the gorge. 97 years prior to this photo, Lewis and Clark would have looked upon the same scene. Remember, at this time the phrase "Bridge of the Gods" is a fresh term from Balch's book published in 1890 and a new addition in 1902. There are some written stories of white men hearing verbal stories of Indians remembering when they were young and traveling by canoe through a rock tunnel in the river. The geology of the Red Bluff Landslide which is what you are looking at in this photo. That large pulley mechanism we see is used to raise and lower the spiral buckets so they can be kept at the optimal level with respect to the river flow. In this picture the river is below the minimum operating level for the fish wheel. Ooops...not my last link. I was looking for this HHR photo which showed the fish wheels on the Washington side. Thanks for all the info. More elaborate than anything I have been around. There is a full size fishwheel in the Interpretive center at Stevensen. They also are showing a video/movie of one in operation, picking up and dumping fish. In many ways this picture shows the glory days on the Columbia. As the one song says, "many a fortune lost and won and many a debt to pay." I am seeing the river flowing to the right, but I am imagining that we are looking from the Oregon side toward Washington. We're looking north toward Washington. What's confusing is that the river takes a jog because of the landslide. It's flowing towards us at several of the cascades, but generally to the left. I had a meeting today at the CL Marine Park, which is basically the view here. After reading some of the links above I have a new appreciation for the incredible size of the landslide. My cousin who is a geologist basically explained the original "Bridge of the Gods" to me. You can see that that slide would have blocked that river due to the size of it. It would have formed a dam, which over thousands of years would slowly be eroded away. He thinks that it is quite probable that there was a dam that eventually had a hole in it, thus forming what is referred to as the bridge. Apparently the main river channel has been pushed south. The main channel originally ran along those northern bluffs. Once you know that, you can see how it ran straight west from Stevenson and came out at Bonneville, rather than taking the southern jog it now does toward the Bridge. If you drive back in there from Ash Lake it is very strange and odd and rugged looking. It's because you are on top of the rubble from the landslide. Sorry I'm late here oh Gorge Lovin' gang...but I'll give some of these queries a go. I'm kind of a fish wheel nut and I've been leading tours for Friends of the Gorge for some years to examine what remnants are left of the fishwheels...and the super-interesting stories of the men behind what Rudyard Kipling referred to as "infernal machines". First off, the MOST important thing is to get your hands on the book "Fishwheels of the Columbia" by Donaldson and Cramer. Of all the many many many history books I've read about the Columbia River, this one is my favorite...by far. Learning about fishwheels doesn't only teach you about fishwheels, it teaches you about the wild undammed river and the settlers who tried to make a go of it...and how chaotic and seasonal everything on the Columbia had to be. An amazing book! Ok, in this pic, on the left you are seeing Frank Warren's most productive fishwheel. Warren as in Warrendale, as in Warren Cannery. Upstream of the high and dry wheel crib, you are seeing riverboard "leads" for floating fishwheel scow boats. These leads ha different "holes" in them so as the river rose/fell the scow tender could move his boat and wheel to a different slot to better catch fish. Fishwheels only operated at the river's highest flows, generally May-July...and fishwheels in the area only could be built successfully between Stevenson and Beacon Rock...the area where the river was pinched and sped-up by the Bonneville Landslide. Frank Warren...now that's a story. Wow, what a man, what a story. I'd love to tell the story if we ever get to have a HHR get-together in the Spring....and maybe we could plan an Autumn outing to see the last vestiges of the fishwheels (I've posted heaps of my pix on GoogEarth in the river just upstream from Beacon Rock). Scott, the fishwheels I have seen working can be found on the internet by looking up Copper River fishwheels or Yukon River fishwheels. They are used where currents aren't all that strong. But they are not used for commercial purposes. Mostly for personal subsistence and to catch enough fish to feed dog teams in the winter. Completely different from what I am seeing here. And all different designs, but working on the same principal..